If you’ve been at all interested in or curious about conservation tillage systems for silage crop production, now is the time to begin preparations and to gear up for the 2011 season. 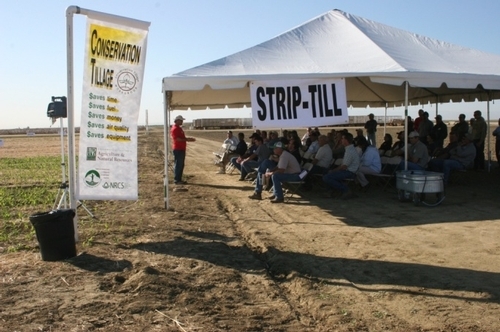 In recent years, members of California’s Conservation Tillage and Cropping Systems Workgroup have been working directly with a number of Central Valley dairy silage producers and together they have learned how to most effectively and successfully adopt a variety of CT practices for silage production. During this time, there have been considerable gains in the overall knowledge base that is needed for successful and sustained CT silage management. There is now also a decent experience base that can help new CT farmers avoid problems and mistakes that can lead to trouble. Through an NRCS Conservation Innovation Grant program called the “BMP CT Challenge,” dairy silage producers once again have an opportunity this year to gain experience with CT systems, to work with CT advisors, to borrow CT equipment and to secure risk management support if CT test strip yields are lower than standard till yields. For more information and to take part in one of our workgroup’s upcoming dairy silage breakfast meetings in your region, please give any of the following folks a call or send an e-mail to them at the addresses indicated below. Information is available for dairy operators interested in conservation tillage.